Designed for 85 - 95 cm tall tabletop. The product is certified for public and housing building use. Within few years of its premiere DIAGO chair has become our trademark product. With its origami-inspired form, DIAGO is both intriguing and memorable. At first it appears raw, nearly industrial, yet it comes out as comfortable and weightless once one give it a try. Its endurance and ergonomy are impressive. It constanly reinvents itself, always coming up with new colours and finishings and still its potential feels absolutely unlimited. This time we are offering you something exeptional: DIAGO KITCHEN STOOL and DIAGO BARSTOOL. Adjusted for two different tabletop heights, these will perfectly suit you: either with your morning latte or the late night pale ale. New, modified shape makes the seats look fierce and dynamic. 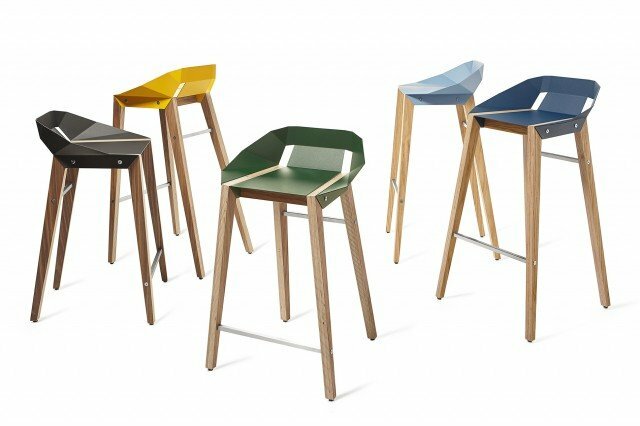 as their tall, slender supports give DIAGO STOOLS the dignified aura you were all looking for.